Josef Hack was born in 1904 in Essen. 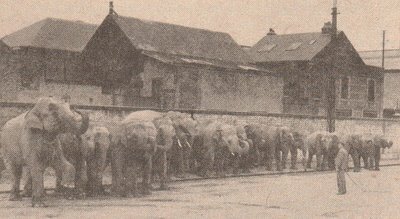 Hack started his career with elephants as bullhand at Circus Hagenbeck, 1934 he fetched 16 elephants at Cirkus Kludsky after their bankrupsy, which he brought to Circus Amar in France. After working for Amar, he came to Munich Zoo and Circus Knie in Switzerland. He became one of the foremost experienced keepers and trainers of elephants in Europe, worked over 100 elephants, and was present at six births during a time when they were sensationally rare, among them the first birth of an african elephant in captivity (Munich 1943). Known pupils to Josef Hack was Wolfgang Ramin and Ruppert Bemmerl.